Apply clustering to a projection to the normalized laplacian. In practice Spectral Clustering is very useful when the structure of the individual clusters is highly non-convex or more generally when a measure of the center and spread of the cluster is not a suitable description of the complete cluster. For instance when clusters are nested circles on the 2D plan. If affinity is the adjacency matrix of a graph, this method can be used to find normalized graph cuts. or a k-nearest neighbors connectivity matrix. Alternatively, using precomputed, a user-provided affinity matrix can be used. The dimension of the projection subspace. A pseudo random number generator used for the initialization of the lobpcg eigen vectors decomposition when eigen_solver == ‘amg’ and by the K-Means initialization. Use an int to make the randomness deterministic. See Glossary. Kernel coefficient for rbf, poly, sigmoid, laplacian and chi2 kernels. Ignored for affinity='nearest_neighbors'. If a string, this may be one of ‘nearest_neighbors’, ‘precomputed’, ‘rbf’ or one of the kernels supported by sklearn.metrics.pairwise_kernels . Only kernels that produce similarity scores (non-negative values that increase with similarity) should be used. This property is not checked by the clustering algorithm. Number of neighbors to use when constructing the affinity matrix using the nearest neighbors method. Ignored for affinity='rbf'. Stopping criterion for eigendecomposition of the Laplacian matrix when using arpack eigen_solver. The strategy to use to assign labels in the embedding space. There are two ways to assign labels after the laplacian embedding. k-means can be applied and is a popular choice. But it can also be sensitive to initialization. Discretization is another approach which is less sensitive to random initialization. Degree of the polynomial kernel. Ignored by other kernels. Zero coefficient for polynomial and sigmoid kernels. Ignored by other kernels. Parameters (keyword arguments) and values for kernel passed as callable object. Ignored by other kernels. Affinity matrix used for clustering. Available only if after calling fit. Where delta is a free parameter representing the width of the Gaussian kernel. Another alternative is to take a symmetric version of the k nearest neighbors connectivity matrix of the points. If the pyamg package is installed, it is used: this greatly speeds up computation. fit(X[, y]) Creates an affinity matrix for X using the selected affinity, then applies spectral clustering to this affinity matrix. 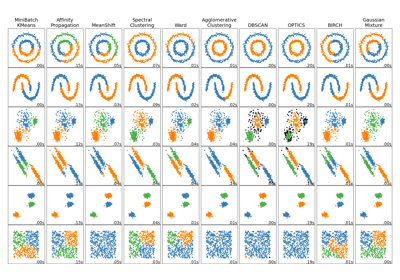 fit_predict(X[, y]) Performs clustering on X and returns cluster labels. Creates an affinity matrix for X using the selected affinity, then applies spectral clustering to this affinity matrix.